For other uses, see Black Light (disambiguation). One type of lamp has a violet filter material, either on the bulb or in a separate glass filter in the lamp housing, which blocks most visible light and allows through UV, so the lamp has a dim violet glow when operating. Blacklight lamps which have this filter have a lighting industry designation that includes the letters "BLB". This stands for "blacklight blue", which is a contradiction in that they are the type that does not look blue. 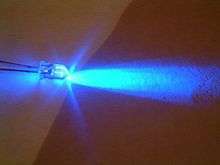 A second type of lamp, which is also called a blacklight, produces ultraviolet but does not have the filter material, so it produces more visible light and has a blue color when operating. These tubes are made for use in "bug zapper" insect traps, and are identified by the industry designation "BL". There are also LEDs of a similar color made for use in novelties like Halloween string lights and strobes, and as a flashlight on the caps of felt-tip markers that write in UV-reactive "secret" ink. Blacklight sources may be specially designed fluorescent lamps, mercury vapor lamps, light-emitting diodes, lasers, or incandescent lamps; although incandescents produce almost no blacklight (except slightly more for halogen types), and so are not considered true blacklight sources. In medicine, forensics, and some other scientific fields, such a light source is referred to as a Wood's lamp, named after Robert Williams Wood. Although many other types of lamp emit ultraviolet light with visible light, black lights are essential when UV-A light without visible light is needed, particularly in observing fluorescence, the colored glow that many substances emit when exposed to UV. Black lights are employed for decorative and artistic lighting effects, diagnostic and therapeutic uses in medicine, the detection of substances tagged with fluorescent dyes, rock-hunting, the detection of counterfeit money, the curing of plastic resins, and attracting insects. Strong sources of long-wave ultraviolet light are used in tanning beds. Although the low-power UV-A emitted by black lights is not a hazard to skin or eyes and can be viewed without protection, powerful ultraviolet sources present dangers and require personal protective equipment such as goggles and gloves. ). "Blacklight Blue" lamps peak at 365 nm. Manufacturers use different numbering systems for black light tubes. Philips uses one system which is becoming outdated (2010), while the (German) Osram system is becoming dominant outside North America. The following table lists the tubes generating blue, UVA and UVB, in order of decreasing wavelength of the most intense peak. Approximate phosphor compositions, major manufacturer's type numbers and some uses are given as an overview of the types available. "Peak" position is approximated to the nearest 10 nm. "Width" is the measure between points on the shoulders of the peak that represent 50% intensity. Wood's glass tubes manufactured by Osram use a fairly narrow-band emitting phosphor, europium activated strontium pyroborate with a peak at about 370 nm, whereas North American and Philips Wood's glass tubes use lead-activated calcium metasilicate that emits a wider band with a shorter wavelength peak at about 350 nm. These two types seem to be the most commonly used. Different manufacturers offer either one or the other and sometimes both. Another class of UV fluorescent bulb is designed for use in "bug zapper" flying insect traps. Insects are attracted to the UV light, which they are able to see, and are then electrocuted by the device. These bulbs use the same UV-A emitting phosphor blend as the filtered blacklight, but since they do not need to suppress visible light output, they do not use a purple filter material in the bulb. Plain glass blocks out less of the visible mercury emission spectrum, making them appear light blue-violet to the naked eye. These lamps are referred to by the designation "blacklight" or "BL" in some North American lighting catalogs. These types are not suitable for applications which require the low visible light output of "BLB" tubes lamps. A black light may also be formed by simply using Wood's glass as the envelope for a common incandescent bulb. This was the method that was used to create the very first black light sources. Although incandescent black light bulbs are a cheaper alternative to fluorescent tubes, they are exceptionally inefficient at producing UV light since most of the light emitted by the filament is visible light which must be blocked. Due to its black body spectrum, an incandescent light radiates less than 0.1% of its energy as UV light. Incandescent UV bulbs, due to the necessary absorption of the visible light, become very hot during use. This heat is, in fact, encouraged in such bulbs, since a hotter filament increases the proportion of UVA in the black-body radiation emitted. This high running-temperature drastically reduces the life of the lamp, however, from a typical 1000 hours to around 100 hours. High power mercury vapor black light lamps are made in power ratings of 100 to 1000 watts. These do not use phosphors, but rely on the intensified and slightly broadened 350–375 nm spectral line of mercury from high pressure discharge at between 5 and 10 standard atmospheres (500 and 1,000 kPa), depending upon the specific type. These lamps use envelopes of Wood's glass or similar optical filter coatings to block out all the visible light and also the short wavelength (UVC) lines of mercury at 184.4 and 253.7 nm, which are harmful to the eyes and skin. A few other spectral lines, falling within the pass band of the Wood's glass between 300 and 400 nm, contribute to the output. These lamps are used mainly for theatrical purposes and concert displays. They are more efficient UVA producers per unit of power consumption than fluorescent tubes. A Wood's lamp is a diagnostic tool used in dermatology by which ultraviolet light is shone (at a wavelength of approximately 365 nanometers) onto the skin of the patient; a technician then observes any subsequent fluorescence. For example, porphyrins—associated with some skin diseases—will fluoresce pink. Though the technique for producing a source of ultraviolet light was devised by Robert Williams Wood in 1903 using "Wood's glass", it was in 1925 that the technique was used in dermatology by Margarot and Deveze for the detection of fungal infection of hair. It has many uses, both in distinguishing fluorescent conditions from other conditions and in locating the precise boundaries of the condition. Fungal infections. Some forms of tinea, such as Trichophyton tonsurans, do not fluoresce. Propionibacterium acnes, a bacterium involved in acne causation, exhibits an orange glow under a Wood's lamp. A Wood's lamp may be used to rapidly assess whether an individual is suffering from ethylene glycol poisoning as a consequence of antifreeze ingestion. 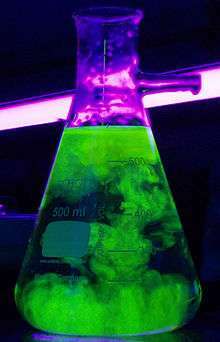 Manufacturers of ethylene glycol-containing antifreezes commonly add fluorescein, which causes the patient's urine to fluoresce under Wood's lamp. Wood's lamp is useful in diagnosing conditions such as tuberous sclerosis and erythrasma (caused by 'Corynebacterium minutissimum', see above). Additionally, detection of porphyria cutanea tarda can sometimes be made when urine turns pink upon illumination with Wood's lamp. Wood's lamps have also been used to differentiate hypopigmentation from depigmentation such as with vitiligo. A vitiligo patient's skin will appear yellow-green or blue under the Wood's lamp. Its use in detecting melanoma has been reported. 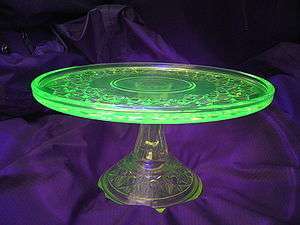 Uranium glass glows under UV light. 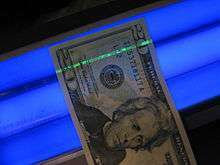 The security thread of a US$20 bill glows green under black light as a safeguard against counterfeiting. Other security applications include the use of pens containing a fluorescent ink, generally with a soft tip, that can be used to "invisibly" mark items. If the objects that are so marked are subsequently stolen, a black light can be used to search for these security markings. At some theme parks, nightclubs and at other, day-long (or night-long) events, a fluorescent mark is rubber stamped onto the wrist of a guest who can then exercise the option of leaving and being able to return again without paying another admission fee. In medicine, the Wood's lamp is used to check for the characteristic fluorescence of certain dermatophytic fungi such as species of Microsporum which emit a yellow glow, or corynebacterium which have a red to orange color when viewed under a Wood's lamp. Such light is also used to detect the presence and extent of disorders that cause a loss of pigmentation, such as vitiligo. It can also be used to diagnose other fungal infections such as ringworm, microsporum canis, tinea versicolor; bacterial infections such erythrasma; other skin conditions including acne, scabies, alopecia, porphyria; as well as corneal scratches, foreign bodies in the eye, and blocked tear ducts. Fluorescent materials are also very widely used in numerous applications in molecular biology, often as "tags" which bind themselves to a substance of interest (for example, DNA), so allowing their visualization. Black light can also be used to see animal excreta such as urine and vomit that is not always visible to the naked eye. One of the innovations for night and all-weather flying used by the US, UK, Japan and Germany during World War II was the use of UV interior lighting to illuminate the instrument panel, giving a safer alternative to the radium-painted instrument faces and pointers, and an intensity that could be varied easily and without visible illumination that would give away an aircraft's position. This went so far as to include the printing of charts that were marked in UV-fluorescent inks, and the provision of UV-visible pencils and slide rules such as the E6B. ↑ Kitsinelis, Spiros (2012). The Right Light: Matching Technologies to Needs and Applications. CRC Press. p. 108. ISBN 1439899312. ↑ Miller, Larry S.; McEvoy Jr., Richard T. (2010). Police Photography (6th ed.). Elsevier. p. 202. ISBN 143775581X. 1 2 3 4 5 Booth, C. (1971). Methods in Microbiology. 4. Academic Press. p. 642. ISBN 0080860303. 1 2 3 4 5 Simpson, Robert S. (2003). Lighting Control: Technology and Applications. Taylor & Francis. p. 125. ISBN 0240515668. 1 2 3 4 5 6 "Black Lights". Technical information. Glow Inc. 2010. Retrieved January 16, 2013. 1 2 3 Rorie, Benjamin (2011). "How Do Black Lights Work?". Blog. 1000Bulbs.com. Retrieved January 16, 2013. ↑ "About Black Light" (PDF). Insect-O-Cutor. ↑ "Phillips Lighting E-Catalog". philips.com. 2011. Retrieved 2011-10-28. ↑ Zaithanzauva Pachuau; Ramesh Chandra Tiwari (October–December 2008). "Ultraviolet Light- its Effects and Applications" (PDF). Science Vision. 8 (4): 128. ↑ Prevost E. (October 1983). "The rise and fall of fluorescent tinea capitis". Pediatr Dermatol. 1 (2): 127–33. doi:10.1111/j.1525-1470.1983.tb01103.x. PMID 6680181. ↑ Tony Burns; Stephen Breathnach; Neil Cox; Christopher Griffiths (2010). Rook's Textbook of Dermatology. John Wiley and Sons. pp. 5–. ISBN 978-1-4051-6169-5. Retrieved 14 November 2010. ↑ Mike Phillips (2007-09-25). "Eikone.com". Eikone.com. Retrieved 2011-11-08. ↑ Hemady, N.; Noble, C. (2007). "Photo Quiz — An infant with a hypopigmented macule". Am Fam Physician. 75 (7): 1053–4. PMID 17427621. ↑ Le, Tao; Krause, Kendall (2008). First Aid for the Basic Sciences—General Principles. McGraw-Hill Medical. ↑ Cole, Curtis; Forbes, P. Donald; Davies, Ronald E. (1986). "An Action Spectrum for UV Photocacinogenesis". Photochem Photobiol. 43 (3): 275–284. doi:10.1111/j.1751-1097.1986.tb05605.x. PMID 3703962. ↑ "ESPCR Blog". European Society for Pigment Cell Research. ↑ Zeman, Gary (2009). "Ultraviolet Radiation". Health Physics Society. ↑ Gupta, I. K.; Singhi, M. K. (2004). "Wood's Lamp". Indian J Dermatol Venereol Leprol. 70 (2): 131–5. PMID 17642589. ↑ Communication Aids for Language and Learning—UV light Equipment for use in sensory rooms for students with profound and multiple learning difficulties in United Kingdom schools. ↑ The fluorometric determination of lysergic acid diethylamide and ergonovine A fluorometer was designed to detect very small amounts of LSD and ergonovine. The instrument proved less satisfactory than the Bowman fluorometer. Both LSD and ergonovine lost their fluorescence very rapidly upon strong ultraviolet irradiation. The mechanism involved in this decrease in fluorescence is not known. Wikimedia Commons has media related to Black light. 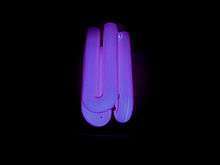 "U.V.C to U.V.A conversion Phosphors for Black Light sources". Sylvania. Archived from the original on 2011-07-24. "What Materials Glow Under a Black or Ultraviolet Light?". About.com. "Database of fluorescent minerals with pictures, activators and spectra". fluomin.org.